Broken O Ranch in Augusta, Montana, is a farming operation that grows wheat, barley, alfalfa, flax, canola and chickpeas on about 12,000 irrigated acres. A big concern at the ranch is how to handle crop residue without burning it. Most states around Montana have banned all burning of residue. Dale Clark, the farm manager at Broken O Ranch, feels that it's only a matter of time before the practice is banned in Montana as well. But he also has bigger issues with the practice. "At Broken O, we’ve been looking for a sustainable solution that we can implement right now,” he says. 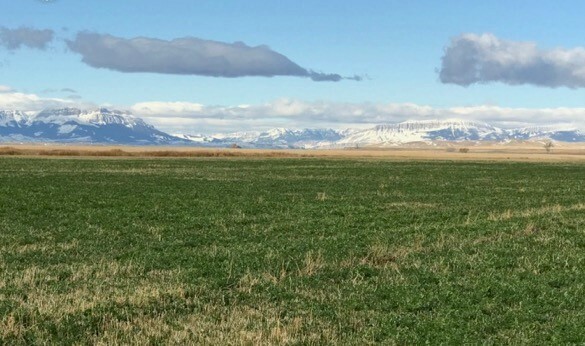 Striving for a residue management system that dovetails with his no-till approach to farming, Dale tried Extract PBA in the fall of 2017 after a large harvest, applying it on three circles of straw (one durum wheat, one spring wheat and one malt barley). Dale's durum wheat and malt barley yields that year topped 120 bu/acre, while his spring wheat reached 95-100 bu/a. 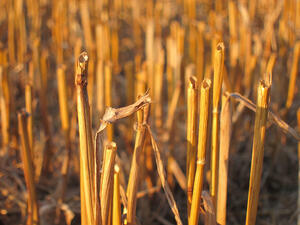 On a dry matter basis, the straw in the durum wheat field alone was approximately 6 tons/acre. With the goal of breaking down the large amount of residue from his harvest and recycling carbon and nutrients back into the soil profile*, Dale applied Extract PBA at a rate of 1 gal/acre with 2 gallons of UAN 32% through a center pivot with 1-inch of moisture. In the spring at planting, Dale's no-till drills were able to make it through the durum residue successfully. Root balls from the previous crop broke apart, and the residue was decomposed enough to allow for planting. In the spring wheat field, excessively large windrows had been created by the combine at harvest. The concentration of residue into large windrows unfortunately proved too big a challenge for the rate of Extract PBA that was used, and the field was burned. The field of barley straw was also burned due to excessive residue from the large crop. Residue management is critical for soil health, soil moisture management, and nutrient management, all of which can lead to more sustainable crop yields. Previously, Dale’s main option for residue management at Broken O Ranch was to burn the residue. He now feels like he has another option—Extract PBA—which allowed him to spare one field from being burned. This not only saved time and labor, but also had soil and plant health benefits. Dale will continue to experiment with higher rates of Extract PBA to sustainably break down his large amounts of residue and mineralize nutrients produced by his high-yielding crops†. Learn more about Extract PBA by downloading the Extract PBA booklet. *Typically, one ton of wheat straw contains 9-12 lbs of nitrogen, 3-4 lbs of phosphorus (P2O5) and 25-45 lbs of potassium (K20). The nitrogen and phosphorus in cereal grain residue is in an organic form that is not available for plants to use as fertilizer. It must be broken down into inorganic plant-available forms: NH4+ (ammonium) and HPO4 (hydrogen phosphate), respectively. †In previous wheat residue trials where cereal grain yield topped 100 bu/acre, an application of the biocatalyst technology in Extract PBA at 3 qts/acre led to a statistically significant increase in crop yield (at .05) when applied with 1 or 2 gallons of UAN 32 %.